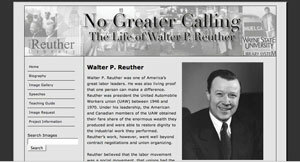 According to a listserv message I received today, “Wayne State’s Walter P. Reuther Library of Labor and Urban Affairs has been awarded the 2008 John Sessions Memorial Award for its online resource: ‘No Greater Calling: The Life of Walter P. Reuther, 1907-1970.‘” This website was one of the projects I was a part of for the Recruiting and Educating Librarians for the 21st Century, while at Wayne State University. I want to take the time to say thank you for all the hard work by my fellow grant recipients on this project and congratulate them, too: Mignon Camara, Iman Dagher, Anna Fast, Megan Garza, Somaly Kim, Sharon Williams, and Akilah Wood. John Sessions Memorial Award A plaque given to a library or library system to honor significant work with the labor community and to recognize the history and contributions of the labor movement toward the development of this country. (Established 1980) The jury is a committee comprised of three to five RUSA members who have demonstrated interest in or experience with library service to labor groups. Members serve two-year terms. Consecutive terms are not permitted. Nominees will be reviewed in a closed meeting of the committee during Midwinter.